I know. This title is a little misleading. My cats are not having kittens... but I do LOVE them. The cats I am referring to are the tiny cat paintings I am doing for the open house. I love the whimsy... and I like how I feel when I paint cats. I think about the silly things my cats do, how they chirp when they see birds, how they wedge into a small space to sleep, and how my little old kitty snores (loudly...she's twenty one). This winter I received a request for more tiny cats (thanks, Jean!) so a new little series will be available Mothers Day Weekend for the "Art on Union Street". From there they will travel to the Newburyport Farmers Market. Meow. 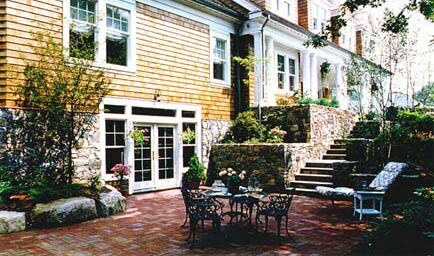 (Photo of Wickford, RI project by Ironwood Design Group) I am SO excited... Jeff Hyland of Ironwood Design Group will be here Friday May 6 and Saturday May 7 for the 6th Annual "Art on Union Street" spring open house. He will be offering 15 minute personal consultations both days. Bring your pics and burning questions about a spring design idea for your yard or business... fencing, drainage, local guidelines, best materials, green approaches, patio and deck needs, water features. Jeff can spend a few minutes giving you feedback on your ideas to send you in the best direction. Click the link above to see more about Ironwood. There are only 8 spots each day, so mark your calendar and contact me to make your appointment. More "Art on Union Street" event info to come... just remember to keep an eye out for the white art tent and the blue umbrella in May! Best in creativity... see you soon. Main Street Art in lovely Newfields, NH. The group organized a few wonderful pieces of work done by the Artists Advisory Committee. Jim Sanner, sculptor, assemblage artist, and boat builder has three dimensional collages that take you to places and times reminiscent of the water. Tracy Hines, aspiring designer, showed her work for the first time. Duane Martin is an award-winning intarsia artist who was recently featured on Chronicle. Kelley Corson, a founder of Main Street Art (and lover of all things good), showed her explorations in mosaics and painting. Sam Paolini featured her abstract "out there" energy and visuals... color is definitely her language (keep an eye out for this girl!). Ray LeBranche with his beautiful earthy pottery. Joe Perna photography... images of places travelled including one of my favorites, a nicely balanced photo of a door on a cream wall with a sparse vine climbing the surface. The show continues 12-3 on March 19, 26, April 2, 9 and 16. Share this with your friends on facebook by clicking the icon below. Best wishes in creativity! And the winner is ... Kelley! A few more emails came in and they names were tossed into the hat. Congratulations Kelley! I hope this top inspires many creative adventures. More comments for the table top? Several people have written comments via email.... either way is fine. I am so glad my art brings "good energy" to your day. If you have been checking in to read the notes, please, do leave one! Who knows... you might even read one from someone you met here during class but haven't seen in years. The random drawing will be Tuesday, March 8. Anyone can enter. I will contact (and post by first name) the winner on Wednesday. These notes came in via email. Thanks for writing. If you haven't chimed in yet, there is still time! :-) I will add them to the hat. Will the cats ever forgive us? I was always amazed that your big cat would hang around for so long with all the commotion.... did he ever get the paint out of his fur? :-) Love, your stuff, Carla. What happens when you combine a new england artist, cabin fever, and bollywood tunes? This is my kitchen now. We are all still alive. I am very happy to have expressed myself in a positive and constructive way. Last night my husband wore a tiny sombrero, my neighbor relaxed in a polka dot tutu, and his wife set a new trend with a tiara on TOP of a baseball cap. If you have ever lived in New England in winter, you may appreciate this. My kitchen wall WILL be on display at our annual Spring Open House. Mark your calendar for color on May 6 & 7. Don't forget to leave a comment below if you would like to enter the drawing for my hand-painted table top (scroll down).... or leave a comment just for fun. Have a light-filled, joyous day! I'm so excited about this newest series I am working on. This panel is one of five of the same color scheme... a deep earthy yellow oxide mixed with cadmium red on a raw umber-ish background. The colors really are all "ish"s because none of my colors actually end up being just straight from the tube... I always mix and blend before painting them on the canvas. When I envision this painting's use, I see it on a wall with two of it's pals... or on fabric for a scarf... or maybe even as a rug. Part of the fun of working with somewhat abstract images is thinking about the possibilities for future applications. For the moment, though, it just makes me feel good and warm. See this and its "relatives" at our upcoming Spring Open House this May 6 and 7... and tell me what you think.